Fifteen years after taking the helm at the Alaska Sea Grant Marine Advisory Program, Paula Cullenberg is stepping down at the end of March 2018. Cullenberg, who has been Alaska Sea Grant director since 2013, is a professor specializing in commercial fisheries, human dimensions and coastal community development at the University of Alaska Fairbanks, College of Fisheries and Ocean Sciences. She has authored papers on topics ranging from climate change adaptation to how Alaska can reverse the aging of its commercial fishing fleet. She and her husband have run a setnet salmon business in Bristol Bay for 30 years along with their two sons. She recently sat down for a wide-ranging interview with Alaska Sea Grant communications manager Paula Dobbyn. How did you wind up in Alaska? I grew up in Massachusetts and after college ended up working on a fishing boat off the coast of Maine that was skippered by a guy from Seattle. After working for him I realized that it was pretty unusual back in the 1970s to be on a fishing boat in New England as a single woman. I migrated west with the intent of commercial fishing and ended up mending nets for a woman from Port Townsend whose husband had drowned while fishing, leaving her to raise two small kids. I met a local fisherman there and ended up gillnetting in the Strait of Juan de Fuca for three seasons. My first job in Alaska was as a fisheries observer on a Russian fishing boat. There weren’t many observers in the Bering Sea then, maybe a handful, but it was an amazing experience. I spent two months in the Bering Sea in the winter and then I went back to Washington and went to grad school in fisheries at the University of Washington. My first real job in Alaska came in 1982 when Henry Mitchell hired me to work as an extension agent for the Bering Sea Fishermen’s Association. It was an incredible opportunity to travel to coastal villages all across western Alaska. I helped start the first commercial halibut fishery in Area 4E off Nelson and Nunivak Islands, helped fishing families do their taxes along the Kuskokwim River, and surveyed Hooper Bay prospecting for yellowfin sole. It was a wonderful and truly unique job and I worked with people living in villages across the state. So that’s what really got me up here permanently. After that there was no looking back. I had promised my dad it was just going to be a five-year stint, like many of us do in our twenties. But as you know, Alaska is full of adventure and I was an adventure seeker. Alaska had and still has amazing opportunities for young people and it was a great place to raise my family. What attracted you to work in the fields of science and fisheries? I’ve always been an outdoor person so I ended up studying ecology in college. When I was in college I met my first extension agent, this guy named Mack from Maine. I was doing a project assessing the clam populations of a few coastal towns and he just was sort of this easygoing, friendly guy who came and helped me learn how to measure and age clams. And I thought, I’d like that job. I think as you develop your career path, you have to figure out how much “people contact” you want to have in your job, how much feedback you need, where you fit. I did a lot of mathematical fisheries population dynamics work in graduate school and I learned that I don’t have enough patience to be a scientist. I just realized I was more suited to policy, making that link between people and understanding science as opposed to actually doing science. How did you come to work for Alaska Sea Grant? In the mid 1980s the Marine Advisory Program, which is part of Alaska Sea Grant, had posted a job in Bristol Bay, in Dillingham, and I got that position. I was in Dillingham for five years working with local fishermen on a whole range of issues. My first son was born there at Kanakanak Hospital—I was the only one in the hospital that night. We left the state in 1990 and I worked at Washington Sea Grant for a time, but we missed Alaska and came back soon after my second son was born. I worked for the Alaska Fisheries Development Foundation and directed the University of Alaska Anchorage Observer Training Center for seven years and finally migrated back to the Marine Advisory Program in 2002. Throughout my career I’ve made it a point to stay involved in commercial fishing. Early on I felt like as a woman it would help my street cred to be able to understand and relate to commercial fishermen by actually being one. When I came to Alaska the first fishery that I was involved in was on the Lower Yukon. We had a skiff built in Nenana and brought it down to Emmonak and I fished there for five years. And then when I took the Bristol Bay job I sold that permit and bought a setnet permit in Bristol Bay and we’ve been fishing there since. Now my two sons run the fishing operation and we’re selling some fish in Anchorage and putting up fish for our family. Being a commercial fisherman has really anchored my understanding of some of the issues that relate to management and policy in a way that you aren’t able to do if you’re just trained as a scientist. So that interaction of people in the community and their dependence on natural resources that is so deep in this state is what really always interested me and has given me the motivation to do the work that we do in Sea Grant. What do you see as the most challenging issues in coastal Alaska today? I don’t feel that our state has made a clear commitment to the future of coastal and rural Alaska. Since we don’t have a clear game plan when it comes to our communities that are off the road system, there is uncertainty. When the state’s budget is great and times are good, there’s lots of resources and when the opposite is true it’s not clear what our state’s philosophy is toward supporting schools and economic development and health care and public safety in our communities. I think that has been really challenging for coastal communities because they don’t know what their future holds. How do you see climate change affecting coastal Alaska? The loss of sea ice up north is huge. Animals are behaving differently and people are unfamiliar with how to live with thin ice or open water in the winter. I don’t think there are any Alaskans who have not felt or seen the changes from climate change. What do you see as Alaska Sea Grants’ role in addressing some of these challenges? I think that if there was ever a state that could use a Sea Grant program it’s Alaska. We are so far away from each other and we’re so few people spread over such a huge geographic area. 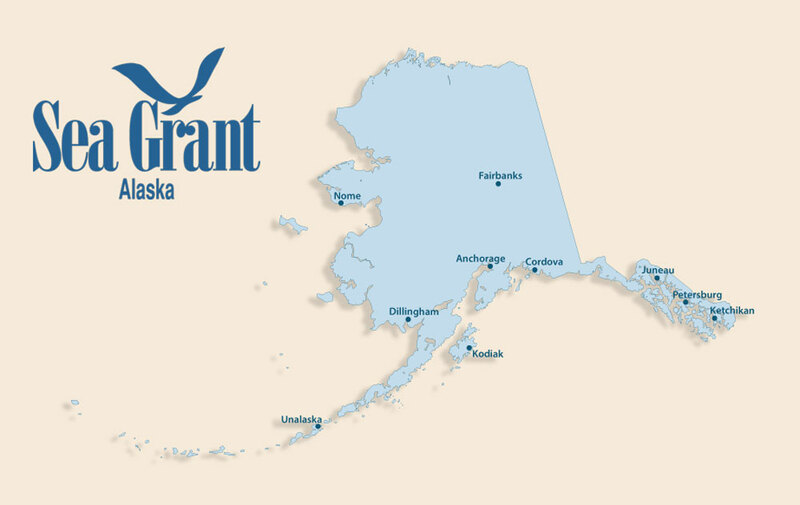 One of the roles for Alaska Sea Grant is just creating those connections and sharing information so that people in the Bering Sea coast can know what’s going on in Southeast Alaska or out on the Aleutian chain or in Kodiak and share that knowledge. Building those partnerships, linking people and creating networks to try to address problems collectively is one really significant role for Sea Grant. A lot of our work is in helping coastal residents find their voice, to have the information that they need to make good decisions and then help them participate to the fullest extent, whether it’s training in public speaking or the regulatory process or helping ensure that local residents are represented in some way. We try to make sure that people have access to the research that’s going on in their backyard. All of those things are critical roles for Sea Grant in our state. I’m pleased with some of the work that we’ve been doing that’s really focusing on building capacity in the next generation of fishing and seafood industry leaders. The Alaska Young Fishermen’s Summit and the Alaska Seafood Processing Leadership Institute and coaching the National Ocean Sciences Bowl and the Alaska Seas and Watersheds elementary school programs that we are doing all support Alaskans. Alaska Sea Grant has taken a leadership role in ensuring that the maritime part of our economy is well understood and that there are opportunities for younger people to understand those jobs and be involved. And we try and do that on a statewide level. What are you most proud of during your career here at Sea Grant? I’m most proud of the passion and the commitment and the talent of the people that are in the program right now. The people in our program really care about the work that they do and are deeply focused on our mission. They are humble and passionate and dedicated people. We’re a very tight group and we communicate a lot despite our great distances. We’ve worked hard to make that the reality and I’m very proud of my part in making Alaska Sea Grant a strong program. Are you hopeful for Sea Grant’s future in Alaska? The White House zeroed National Sea Grant out of the federal budget last year which was a splash of cold water. But the response from Alaskans and people across the country about this was quick and strong. The level of support that we received is an indication to me that we’re doing good, valuable and useful work. We wouldn’t get that level of support from people around the state if we weren’t valuable to them, if we didn’t mean something to them as a program. We are lucky in Alaska that our congressional delegation is committed and understands what we do and certainly is very much a supporter of the maritime economy in our state so yes, I’m hopeful for the future of Alaska Sea Grant. There have been a number of faculty positions in the Marine Advisory Program that have not been filled. Are you concerned about that? Yes, I’m very concerned about that. We’ve lost about half of our Marine Advisory permanent faculty positions in the last five years—positions focusing on aquaculture, tourism, seafood processing—jobs that can help Alaska. I think that’s been true for many parts of the university. I think sometimes that there is a lack of understanding about the value of the university and the depth of the work that the university does around our state. A university is about thinking about the future—about pushing our state toward the next big ideas, supporting the next generation. I don’t think we should shortchange that. I personally feel like it’s OK to ask us, as Alaskans, to contribute to and invest in our government and do that in order to support the collective needs of our state. What will you miss the most after you leave this place? I will definitely miss the people and the friends that I have in our program. And I will certainly miss the work. It’s a stimulating job. The nice thing about Sea Grant, of course, is that everything we do is focused on moving the state forward positively. We are lucky to be in that creative zone of using our federal and our state funds to build partnerships that help our state go forward and so I certainly will miss being the driving force in that program. Any regrets about things you didn’t get to do while you’re here? Five years ago we lost our Bethel Marine Advisory agent. I’ve been really frustrated that we haven’t been able to maintain a presence out in the Yukon Kuskokwim Delta. That part of the state is huge—56 villages, a very traditional part of the state, deep dependence on fish and other resources for food and cultural identity—the need is huge. We haven’t been able to be in that area due to budget restrictions—that’s been a big frustration to me and I regret leaving the job without making that happen. There are some important issues that I care about that are still out there. I have concerns about the loss of fishing permits from some of our coastal communities. I’d like to see that turn around. I think we still have a long way to go before we have clear pathways for young people in our state to get into the maritime careers that are available to them, whether it’s being a harbormaster or a seafood plant manager or a fish biologist. So those issues are still there and hopefully I’ll find a way to keep working on them outside of this position. Well, I’ve been working intensely in this job for so many years that I just haven’t had much of a chance to think about what I’m going to do next. I don’t know if I’m done working. There are issues in our state that I’d like to work on. So I’m looking forward to a break so I can think about what’s next. I’ve been in a leadership role in Alaska Sea Grant for 15 or 16 years now and I just think it’s good to roll that over and have new people come in with new ideas. I feel very lucky and grateful to have been able to help our program grow and to have contributed to our state. But I don’t want to overstay my welcome.